Your time with 2016 is quickly drawing to a close! 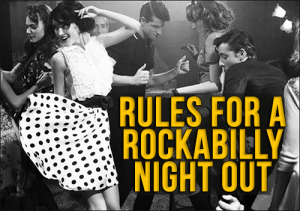 Learn how to have an unforgettable evening with these rockabilly rules for New Year’s Eve. Has 2016 rocked your world? If so, you’re probably going to want to enter the New Year having fun, looking good, and packing back a couple drinks. Rather than scare you with New Year’s statistics on why you should be ‘boy-in-a-plastic-bubble- careful, we’d rather give you our 3 rockabilly rules for New Year’s Eve! The first rule to your rockabilly girl’s night out to celebrate the last of 2016 is to look hot. When you look good, you feel good. We’ve paired our favorite New Year’s rockabilly dress with some other pinup favorites to make sure your outfit is hot and chic for 2017! Miss Rockabilly Ruby does the BEST vintage hairstyles. The tutorials are easy to follow and always give an authentic rockabilly hairstyle. This New Year’s look is fun and screams party. Check out the tutorial below. When you’re getting down for New Year’s, make sure it’s doing something you want to do. It doesn’t matter whether you head to a party with over 100 guests, go to an underground rockabilly rager, or spend the night with just you and your best friend. Just make sure it’s something you actually want to do, not something you feel like you should be doing. Play games, watch movies, binge Netflix, or go to a concert. Just have fun! By the end of the year, people are usually intent on celebrating. No matter what do you to end the year, be sure you do it safely. For example, champagne bottles should be opened carefully at a 45-degree angle with your hand on the cork. Don’t play Pokémon Go and Drive! Don’t do or say anything you wouldn’t do if you were sober. Make sure you have a designated driver or safe ride home for the evening. Otherwise, make sure you have somewhere safe to crash! Leave fireworks to the experts. Yeah, they’re fun and festive, but they can be dangerous too. Another little tidbit? If possible, don’t bring a purse. Reduce your risk of getting anything stolen or drunkenly leaving your belongings somewhere. Instead of a purse, carry your belongings in your bra. Sounds sleazy, but it works! There you have it, our 3 rockabilly rules for New Year’s Eve. Have fun, be safe, and look hot to ring in 2017.